Despite the second Minsk accord between the Kiev government and the Russian separatists of Donetsk and Lugansk signed on February 13 the agony of the people of Eastern Ukraine will go on. Already the human cost has been horrendous. According to the UN’s Office for the Coordination of Humanitarian Affairs 5,486 people have been killed and 12,972 wounded. With fighting continuing and unburied bodies still visible in several locations these figures are obviously underestimates. According to the UN there are still 5.2 million living in the conflict areas, many without access to electricity, water and other basics of modern existence. Infrastructure has been destroyed by shelling and sewers have collapsed. Nearly one million are “internally displaced” within Ukraine (which suggests they are mainly Ukrainian speakers who have fled towards Kiev – if you stay in the East you cannot claim your pension or get paid). A further 600,000 have fled the country with two thirds of them (Russian speakers) heading for Russia. Life here is no bowl of cherries for refugees either. Our own comrades have encountered Ukrainian doctors working as maids in Moscow hotels. 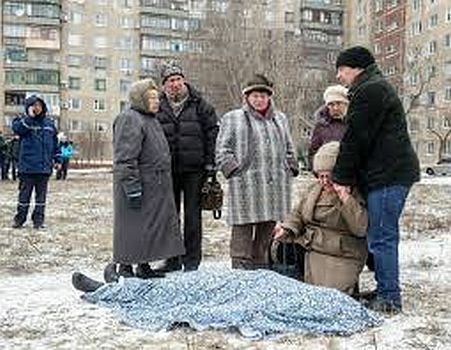 Those left in the Donbass are mainly people who cannot flee, such as the old who huddle in bomb shelters emerging only to get food. There is food in the shops but few have the means to buy it. This is a war which does not have much popular support on either side. When the newly-elected Poroshenko Government of the Ukraine re-introduced conscription there were demonstrations and road blocks mainly set up by women all over Western Ukraine. They were only removed when the Government promised that very few reservists would get sent to the front in the East. On the other side the last independent poll (April 2014) indicated that two thirds of those living in Eastern Ukraine did not want to join Putin’s Russia. Most of the fighters are not from the Donbass (despite Putin’s propaganda about ex-miners and farmers) but are often ex-Russian army soldiers from remote provinces in Russia. What we find is two rabidly nationalist minorities who are determined to impose their will, not only on the enemy but also on the populations who by an accident of history have had this conflict imposed upon them. And in truth Ukraine is being pulled apart to satisfy the demands of a decaying social system which only offers more misery and death to the world’s population. Behind it all lies the bestial appetites of global imperialism. It’s worth recalling briefly how this all started. The first factor we have to remember is the bursting of the speculative bubble in 2008. Economies like Ukraine’s suffered more than most. The economy shrank by 15%, unemployment tripled and exports fell by 40% in 2009. The collapse led to the election of the Yanukovich administration in 2010. In November 2013 the Yanukovich Government which had been negotiating assistance from the IMF as well as accession to the EU suddenly rejected the terms of the EU treaty. It was in a desperate hole. Ukraine’s economy was one of the worst performing in the world with the value of its biggest export earner, steel, being drastically cut. IMF loans had dried up as the regime has been incapable of carrying out the reforms it demanded but $15 billion of its loans were due for repayment in 2014 and there was a continuing budget deficit. The deal with the EU offered money (€27 billion in loans) but on condition that consumer gas subsidies were cut (political suicide for any government). Yanukovich was easy pickings for a “payday loan” from Putin. Russia was after all still Ukraine’s main trading partner and Ukraine is heavily dependent on Russian gas. Putin only had to offer to reduce the price Ukraine paid for its gas from $400 per 1000 cubic metres to $268.5 and a loan of 15 bn dollars with $3 billion paid up front (and another $2 billion by the end of January all at 5% interest – a lot lower than the EU loan offer) to win over Yanukovich. The first protests were by students and young middle class people who saw a more prosperous European future cut off by the u-turn on the EU. These were easily suppressed but then along came US and EU imperialism, and their various financial foundations were soon supporting the more rabidly nationalist and fascist elements who provided the main shock troops of the Maidan. The support the Maidan received from abroad allowed them to continue throughout the winter until Yanukovich simply fled a year ago. The Ukrainian nationalists though could not restrain themselves and immediately announced that Russian was to be excluded as a national language in Ukraine. This was a provocation to the Russian-speaking East and led first to counter-demonstrations and then for Russian nationalist minorities to take over local government buildings. The fear here was the exact opposite of the fear in the West. If the EU/US “coup” which had toppled Yanukovich succeeded then the restructuring of the industrial East would follow with massive job losses in mines and steel foundries. Cue the entry of Russian imperialism’s military support to the East and all the elements of the crisis that has continued to this day are complete. Even before Yanukovich’s departure “little green men” of Russian special forces had appeared in Crimea and by the end of March the entire peninsula was in Russian hands. The following month fighting broke out in the East of Ukraine between pro-Russian separatists and the Kiev regime’s troops. It was clear from the beginning that Putin was sending in arms and even Russian “volunteers” to assist the rebels. Initially the Ukrainian government was slow to respond but after the election of Poroshenko as President in May they began to regain some lost ground and when the Malaysian Airlines flight MH17 was shot down (almost certainly by the separatists) in July the Ukrainian Army was on the advance over a wide area. It looked then as though the separatists were facing defeat. However after a shaky couple of weeks the separatists began once again to regain ground and it soon became clear that not only had they been backed by Russian artillery and tanks but even by Russian troops. Some of these openly admitted where they had come from and announced that their agenda was to build not tin pot Donetsk or Lugansk Republics but New Russia (“Novorossiya”). Putin had not formerly acknowledged the separatist movement but on 29 August he addressed them for the first time. However to the chagrin of the separatists the Russian Government has not formally recognised their votes for independence or the ambitions of some them to make “Novorossiya” an oblast of Russia. So much for the chronicle of events but what was the aim of Russian imperialism at this juncture? The first thing that has to be recognised is that Russia is operating from a position of weakness. Ever since the fall of the Soviet Union the Russian ruling class have had to face the onward Eastern march of both NATO and the EU. During the Yeltsin years when US advisers were riding high in the Kremlin the economy shrank and Russia faced one humiliation after another on the international stage. Year by year NATO and the EU extended eastwards incorporating more and more of the old Soviet Empire into their organisations despite the promises that had been made to Yeltsin that no such thing would happen. But Russia was so economically weakened by the collapse of the USSR and the restructuring of its economy that it could not even suppress the Chechen rebellion within its own borders. All this began to change with the replacement of Yeltsin by the former KGB officer Putin. Chechenya was murderously subdued and a Putin-appointee put in charge. Then came Putin’s support for South Ossetian and Abkhazian revolts against the pro-Western government of Georgia. And when the Ukrainian “Orange Revolution” booted out Yanukovich the first time, Putin retaliated against the pro-Western regime by cutting off gas supplies. For the Kremlin this is only reversing a tidal wave of losses and humiliation imposed by Western powers. The annexation of the Crimea has enabled the West to portray the Putin regime as the “expansionist” one but this is pure hypocrisy. It should not blind us to the fact that it is the USA which since 1990 has proclaimed “A New World Order” which it naturally dominated. It is the United States which has 737 military bases (not counting other military installations) in over 150 countries deploying at least 230,000 troops supported by another 2.5 million personnel. Russia still retains a base in Vietnam at Cam Ranh Bay and another in the Syrian port of Tartus. Apart from that Russia’s bases are to be found only in the former Soviet republics mainly in Central Asia. Indeed that is where Russia’s imperial reach still holds sway though even here it faces enormous challenges. Although Putin has launched several initiatives to create a “Eurasian” economic area dominated by Russia but including Belarus, Armenia, Kazakhstan, Turkmenistan, Kyrgyzstan, Uzbekistan and Tadjikistan it has not been smooth going. It has shown whose boss in the region by organising the overthrow of two Kyrgyz Presidents who allowed the US to establish bases there but the fact that all the economic relations favour Russia (this is imperialism after all) it has caused some friction. Kazakh President Nazarbayev, previously an enthusiastic supporter of Russian ties, has even threatened to pull out of all deals if Russian bullying continues. It was noticeable that Kazakhstan abstained in the UN vote on Russia’s annexation of Crimea last year. The US has now all but pulled out of Central Asia (the Afghanistan withdrawal will complete the process) but the Central Asian republics have an alternative in China’s soft power. They have all welcomed inward Chinese investment and signed deals to sell gas to China thus giving them freedom of movement towards Russian demands. Sanctions and the fall in energy prices too have undermined the currencies of the region (which are linked to the rouble) and this has further undermined Russia’s value to its Asian clients . Putin places much store in the Shanghai Cooperation Council where China and Russia combine to keep the US out of Central Asia. However given the economic weakness of Russia and the growth of China it is quite clear who the junior partner is. China’s hard bargain over Russian gas prices when Putin visited Beijing last summer underlines this. It is this recognition of its own weakness, even in the Eurasian project that makes the Russians so determined to weaken Ukraine and Georgia by playing on separatist tendencies in both country. If they cannot get them to return to the imperial embrace of Russia they can at least keep them in an unstable limbo making them less likely to be integrated into NATO and the EU. That was almost certainly the imperialist aim of Russian policy at the beginning of the Ukraine crisis. However history does not stand still and the patterns shift as one unintended consequence leads to another. With the Crimea falling under Russian control (much of its population are apparently already regretting the transfer to a Russia in economic crisis), with the sanctions which followed, with the continuing stagnation of the global economy there are signs that Russian imperialism scents something more is yet to be gained. This would be to split the EU and the USA over how to respond to the use of naked military power. Despite its easy victory the poor performance of the Russian Army in the war in South Ossetia 9 years ago alarmed the Kremlin. A major overhaul of its capacities and equipment was set in train. Military spending was increased and at 4.1% of GDP is now the highest in the world (the US devotes 3.8% to direct military expenditure which of course means a vastly higher amount than Russia in real terms). Since the increased support for the Russian separatist cause since late July 2014 the military have appeared to be using Eastern Ukraine as a testing ground for their new toys. This is in itself a new and dangerous escalation and much will depend on the response of the West. This is blatant polemical exaggeration. There is no evidence that Russia has any intention to stamp out the Kiev Government but it definitely wants to weaken it, keep it dependent on Russia for economic survival (and a market for gas and oil) and ensure that local autonomy in the Russian-speaking East is increased. It does not want NATO on the doorstep of its “Eurasia” project. For US imperialism this is in itself too much. It does not want its authority flouted and wants to extend the reach of the dollar into as many areas of the world as possible. American hegemony depends upon it. This is well understood by the likes of the Soros Foundation which, along with other US private institutions and investors who have bankrolled two anti-Russian revolts in Ukraine, and want to finish the job of capturing Ukraine for the West. The world has arrived at a dangerous juncture. Global capitalism is in deep crisis. Even the Chinese “miracle” has serious problems and can no longer power a commodity boom. This is no “new Cold War”. The reason the Cold War went on so long was that basically the two leading imperialist powers to emerge from the Second World War were sure in their power and basically happy with their gains. Today it is not the same. The USA is fearful of losing its hegemony and Russia fears further encirclement. It is no accident that imperialist competition for the planet has increased dramatically since the bursting of the speculative bubble. There is an increasing air of desperation in the manoeuvres of the various great powers. US policy may not favour direct invasions as it did under the Bush administrations but it has not weakened its grip. And with its “pivot to Asia” and operations in Eastern Europe it just might be driving Russia and China into the same camp. Despite being narrowly authoritarian capitalist states their imperialist interests do not always coincide but increasingly US policy is driving them together. The dangers for the world should not be understated. And for the imperialist powers to take humanity further down the road to destruction it only needs that the international proletariat continues to do nothing. After years of retreat we are in danger of becoming a class in itself but not for itself, variable capital without a programme or a vision of a different world. Aiding an abetting this weakness are all those who claim to talk for the working class but actually call upon them to support this or that imperialist or nationalist interest as somehow a step towards rediscovering a class position. This is reactionary nonsense. Nations and imperialist powers not only do not represent our interests, they stand in direct opposition to them. Our only way forward as a class is to fight on our own terrain not just against the effects of austerity but also against the brutality and destruction which a decaying social system imposes on our lives. We need autonomous organisation on various levels but above all politically and a coherent anti-capitalist and anti-imperialist programme. It will be a long road back but fighting nationalism, racism and exploitation will be at the heart of any independent working class revival. See article quoted in footnote 1 for more details. The article here is a longer version of one which will appear in Italian in Battaglia Comunista (March edition). Noting the first sentence of the paragraph, warning against our class doing nothing against imperialism, reminds me of the protests against the Vietnam war and suggests to me, for one, ways in which some of that might be used against imperialism today. As well as joining the massive crowd in Trafalgar Square, addressed by Tariq Ali, and then moving off into The Strand en masse behind a very long horizontal bamboo bar, I also remember marching along a road in a small group with a banner and/or placard saying 'Out with imperialism from Vietnam', a slogan which I also put across the rear window of my mini, driving north over 120 miles. Today we can operate on behalf of our class, even when not in large numbers, in various ways, as long as slogans etc are carefully chosen to be fully and only consistent with proletarian interationalism.